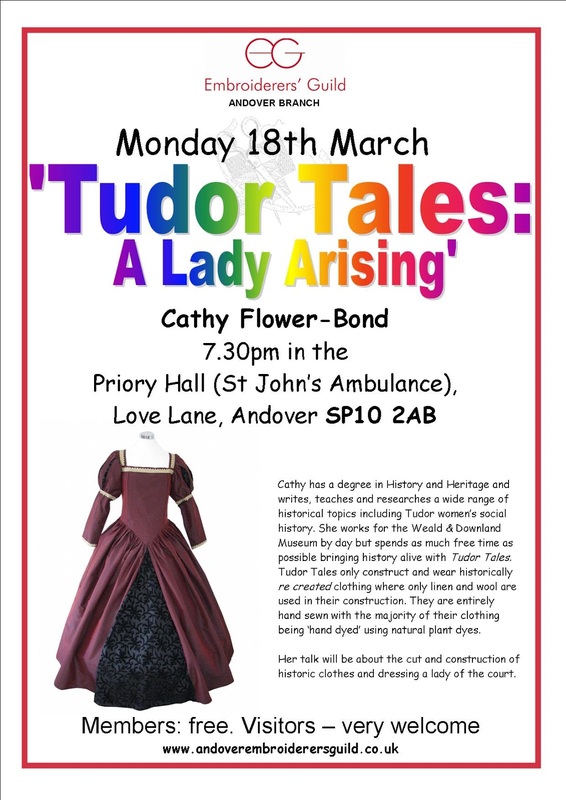 A reminder about our March meeting on Monday 19th - details on the poster below. A very different talk to our usual ones. A group of us saw them at a regional meeting last year and were so impressed that we booked them then and there! The SEW Regional day is on May 4th at Sindlesham Court hosted by the Wokingham Branch and we have had a reminder for ticket sales. Each ticket costs £20 and they would like the forms returned by March 22nd. Please let Eleanor know if you are interested in going so that we can apply for all the tickets at the same time. Also the South West regional day being held this year at St John's School Marlborough on May 18th hosted by the Marlborough Branch. Tickets for this day are £25 but that does include a cooked lunch and refreshments. The speakers are Cas Holmes and Patricia Godwin. As this is close to us you might like to go. Finally a reminder about Kim Thittichai's workshop in April - names and deposits are needed this month. For those of you who have not yet seen the exhibition of the postcards made to celebrate the Olympic Games they are on show at the National Needlework Archive from 26th March – 26th April (Closed 29th March – 1st April inclusive for Easter.) - see the link on the left for more details.